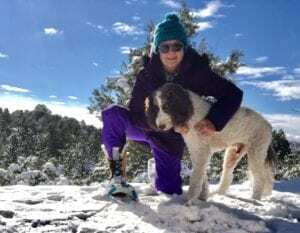 News in the New Year…. Fall of 2018 was an exciting time at Light Art Space. The two featured exhibitions, Age & Seduction by Karen Hymer and the group exhibition Arizona Print Group were well received. Twenty-five people participated in the October cyanotype workshop with great results. Construction is on going in the back of the building – darkrooms and studio space are emerging. The plan is to offer workshops by summer 2019. Listed below are exhibitions, publications, and workshop opportunities. This unique photographic exhibition features the work of 30 artists from Grant County, NM. A wide variety of approaches to photography will be exhibited including techniques such as Silver Gelatin Prints, Image Transfers, Van Dykes, Cyanotypes, and Archival Pigment Prints on paper, canvas and metal. Curated by Karen Hymer. Featuring the work of George Austin, Fred Barraza, Michael P. Berman, catherine bialopiotrowicz, Bruce Bloy, Tom Boblett, Carolyn Cogan, Jeremiah Cogan, Paul Doherty, Dave Egan, Julie Enos, Sandy Feutz, Len Giusti, Natalie Good, Ned Haw, Stephen Hoglund, Brenda Holzinger, Kaitlyn Hopwood, Janey Katz, Chip Leavitt, Lara Leavitt, Christopher Martinez, Jim Mathews, Tom Maxfeldt, Ann McMahon, Jim Pendergast, Eric Renner/Nancy Spencer, Carmen Ruiz, and Tom Vaughan. Featuring the work of Daniel Garver, Lara Leavitt, Jamie Karolich, Art Peterson, Mimi Peterson, Gerry Szajer and Susan Szajer. Photographic Imagery celebrating analog and the hand – made print. Work by Steve Hajdu, Jessica Knight, Maegan McCarthy and Davey Miller. I am so impressed by your dedication, love, energy and organizational skills in running your business. Best of luck with your upcoming events! Thanks, Deb. I hope you can come visit this spring. I will be in Tucson in March – we will have to get together to catch up. Thanks for including me on this e-mailing list. Looks like you’ve got lots of exciting things going on. I’m still up in Iowa, but will be back in Silver City on the 5th and look forward to stopping by your gallery in the days that follow. The book of elk centos was published last week. I’m really pleased with the way it turned out. I’ll be bringing down some copies with me (including yours). Hi Mark – I look forward to reading the book! Safe travels. Good job on the gallery. The Epson printer looks sic. Good thing I’m not there … I’d break it the 1st day I tried it…not to mention how dirty it would get ! Thanks – the printer is a monster but can’t wait to use it. YOu making any art these days??? So fun to see MacRonald drawing again – hope to exhibit his work…mini-reunion in Silver city?? Wow, when Steve and I visited this past summer the storefront was so large and raw, I admit it seemed overwhelmingly daunting to take on the changes you had in mind, but the transformation is magnificent. Congratulations Karen! You are an inspiration. We’ll want to come by in the Spring again, but it might have to be in a couple months when’s Steve’s broken ankle heals. My wife Dvora and I visited your gallery in Silver City this past October. 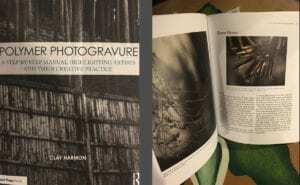 I am itching to learn Polymer Photogravure, and currently reading through the Clay Harmon book now. 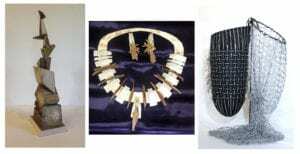 I hope to be able to take your workshop at Sitka in June, We will be in Silver for the Print Fiesta. Wonderful! I hope to see you at Sitka – it is such a wonderful setting for workshops. registration opens in Feb. I believe. Isn’t Clay’s book great? Karen, I loved taking some time to wander through your great website! so impressed with all your work and vision. Can’t wait to get on over there in person.